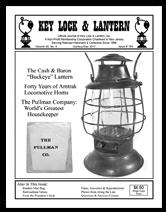 A Close-Up Look at the Cash & Baron Buckeye Lantern, Forty Years of Amtrak Locomotive Horns, Pullman: The World's Greatest Housekeeper, The Effect of Inflation on Railroadiana Prices, An "Old Timer" Collector, Reproduction Globe Alert, Q&A Answers: Milwaukee Road "DCC" Lock, Missouri Pacific Toilet Lock. 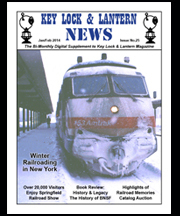 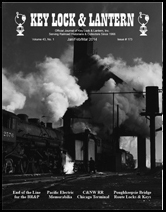 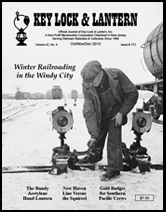 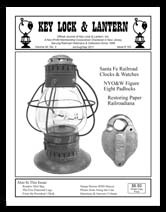 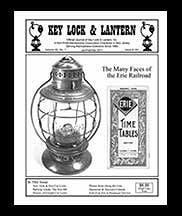 Santa Fe Railroad Clocks & Watches, NYO&W Railway "Figure Eight" Padlocks, Tape Removal Methods for Paper Collectibles, The Erie Railway Diamond Logo, Postage Stamp Honors "Owney" the Railway Mail Service Mascot, Recent Auction Finds" Q&A Answers: Duluth Rainy Lake & Winnipeg key. 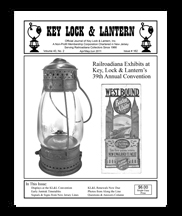 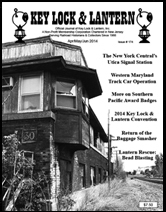 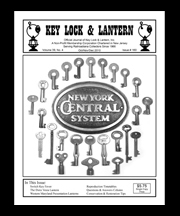 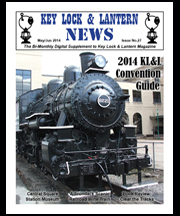 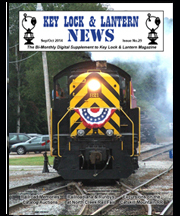 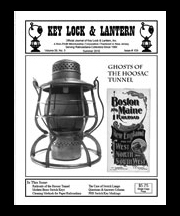 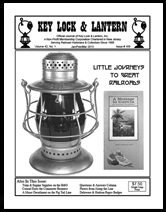 Key Lock & Lantern Convention Exhibits, Early Amtrak "Railroad Issue" Timetables, Signals & Signs from New Jersey Railroad Lines, Q&A Answers: Virginian Railway Globe, Oliver Electric Manufacturing Company, New York Central Orange Avenue Freight House.